What do you get when you mix art with aquamarine? 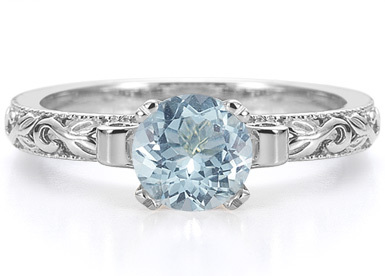 The latest art deco aquamarine ring from Apples of Gold. This lovely combination features a 6mm aquamarine gemstone that glistens in its white gold setting. The mounting shows off two beautiful curls of white gold that lead into the decorated white gold band. The carving of the band is true to the precision and style of art deco, making this aquamarine ring a scintillating combination of fashion and splendor. We guarantee our 1 Carat Art Deco Aquamarine Engagement Ring, 14K White Gold to be high quality, authentic jewelry, as described above.